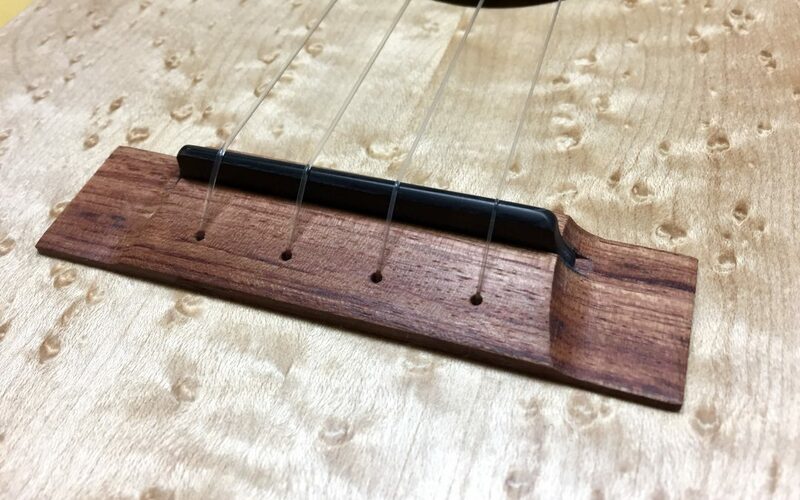 In our most recent ukulele builds we’ve changed over to a drilled-through bridge. There are a number of reasons for this and we’ll go over them here. Besides looking very clean and simple, the drilled-through bridge offers several benefits. With a slotted/knotted bridge where the strings tie directly to bridge, the bridge is secured solely by glue, and the tension of the strings wants to pull it off the soundboard. While it’s not very common, it is possible for a bridge to detach because the torque on the bridge can be significant as the strings are tightened particularly with 5-, 6- and 8-string instruments. With the drilled-through bridge, the strings go through the bridge, the soundboard and the underlying bridge plate and the string tension acts to hold these three elements together rather than pull them apart. We use a small washer on the strings to spread the load of the knot out over a larger area. As modern players tend toward heavier, tighter strings, this can be a soundboard saver. We like to run a relatively thick fretboard (we’ll discuss why in another post) so our saddles need to be high as well. This allows us to have a nice sharp string-bend over the saddle while running a relatively gentle crown on top of the saddle. This combination prevents buzzing at the bridge/saddle and also increases torque on the soundboard. The increased torque gives is better vibration transmission to the soundboard for better volume. One minor drawback is that re-stringing can be a little trickier but it’s not as difficult as you might imagine. You simply feed the strings through the bridge and fish them out through the soundhole. You put on the washer, tie the knot (we use a simple figure 8 knot) and voila, you’re set. An added plus just for me is that it also makes bridge construction easier. Instead of cutting and shaping the knot slot, now we just drill through and shave the bridge down nice and low. Better tone, more bridge security, more comfort, clean good looks… not bad for a small change. Note: You might notice that our saddles do not go all the way to the ends of the saddle slots. They are cut short. We do this to allow easier removal of the saddles. The saddles are sized to fit quite snugly in their slots so we blunt the ends so you can get a small screwdriver under the end to help lift them up.